As the overall mood of the country worsens, Egyptians still have a favorable view of President Morsi and the Muslim Brotherhood, although support for the latter has weakened since 2011. And while support for religious leaders, the military and the court system remains high, fewer now see those institutions as a good influence than during the months after the 2011 revolution. Roughly half of Egyptians (53%) have a favorable view of President Morsi, with 43% holding an unfavorable view of Egypt’s first post-revolution elected leader. This tracks closely with the 51.73% who voted for him in the presidential runoff election of June 2012. Abdel Moneim Aboul Fotouh, a former Muslim Brotherhood member who finished fourth in the election, is also seen positively by 53% of Egyptians. Presidential runner-up Ahmed Shafik and third-place finisher Hamdeen Sabahi receive generally mixed reviews, with less than half of Egyptians (45% and 48%, respectively) viewing them favorably. Meanwhile, Mohamed ElBaradei, a leader of the opposition National Salvation Front (NSF), draws negative reviews, with only four-in-ten Egyptians giving him positive marks and 54% viewing him unfavorably. Ratings for ElBaradei, a former head of the International Atomic Energy Agency, have declined since the revolution. In 2011, nearly six-in-ten (57%) had a favorable view of the Nobel Peace Prize winner. And in last year’s poll, 48% gave him favorable marks. Generally, President Morsi is supported by Egyptians who have positive views of the Islamist-oriented Muslim Brotherhood, Freedom and Justice Party (FJP) and al-Nour. Egyptians who have favorable views of the more secular opposition leaders Sabahi, ElBaradei and Shafik, as well as the NSF, tend to view Morsi less favorably. Attitudes toward leaders are shaped in part by the preferred role of Islam in politics and law. 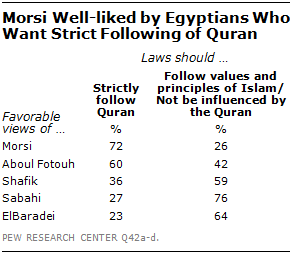 For instance, 72% of those Egyptians who say that laws should strictly follow the Quran have a favorable opinion of Morsi. In contrast, only 26% of those who say laws should only follow the values and principles of Islam or not be influenced by the Quran at all hold a positive view of the president. The same pattern holds for former Muslim Brotherhood member Aboul Fotouh. Meanwhile, more secular leaders, such as ElBaradei, Sabahi and Shafik, get much of their support from those who express less desire for the Islamic holy book to guide the formation of laws. Roughly six-in-ten Egyptians (63%) have a favorable opinion of the Muslim Brotherhood, while 36% express a negative view. This makes the Muslim Brotherhood the most popular of the political organizations tested, although positive evaluations of the Islamist group have fallen 12 percentage points since 2011. The ruling FJP, which was founded by the Muslim Brotherhood but remains nominally independent, is also seen favorably, with 52% of Egyptians holding a positive view of the party. Evaluations of the secular NSF are more mixed; 45% of Egyptians have a positive opinion of the liberal coalition headed by Mohamed ElBaradei, Hamdeen Sabahi and Amr Moussa, while 52% have a negative view. The Salafist al-Nour Party is perceived negatively by the Egyptian people, with only four-in-ten expressing sympathy with the party. Egyptians continue to have positive feelings toward the Supreme Council of the Armed Forces (SCAF), the military body that took control of Egypt for many months after Mubarak’s ouster in 2011. In the current poll, two-thirds have a favorable view of the SCAF, with one-third expressing negative views, virtually unchanged from 2012. The Supreme Constitutional Court, which was responsible for dissolving the FJP-led parliament in 2012, receives a split verdict from the Egyptian public. Half say that they have a favorable impression of the judicial body, while 47% express an unfavorable opinion. Perceptions of political leaders are tied to opinions about the high court. For example, a whopping 96% of those who have an unfavorable view of President Morsi have a favorable view of the Supreme Constitutional Court. And 88% of those who give ElBaradei a positive rating have a favorable view of the court. 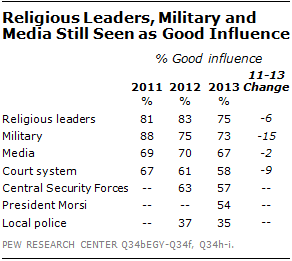 Roughly three-quarters of Egyptians believe that religious leaders (75%) and the military (73%) are a good influence on the way things are going in Egypt. Two-thirds say the media, such as television, radio, newspapers and magazines, are having a good influence on the country, while around six-in-ten rate the court system (58%) and the Central Security Forces (57%) as a good influence. President Morsi is seen as a positive influence by 54% of Egyptians. The local police continue to receive negative ratings from the Egyptian people, with 35% saying they are a good influence on the country and 63% saying they are a bad influence. Since 2011, ratings for the military, court system, and religious leaders have fallen, although support for each institution is still high. The biggest decline is on the influence of the military. In 2011, 88% of Egyptians said the military was a good influence on the country, but by 2013 that figure has fallen 15 percentage points. Similarly, positive ratings for the court system and religious leaders have fallen nine and six percentage points, respectively. In general, support for these institutions is similar across demographic groups. However, men give higher marks than women to the court system, Central Security Forces and the local police. In addition, people who express a favorable view of ElBaradei and the NSF are more likely to have a positive view of the media, while those who have a favorable opinion of President Morsi, the Muslim Brotherhood and the FJP tend to think religious leaders are a good influence.